Seeing double is no picnic and, in some cases, it can be quite scary. Once you understand the root causes of double vision, however, you can work with an eye care professional to find an appropriate treatment. You may be asking yourself, “Why am I seeing double?” There can be a variety of reasons for it, but let’s begin with a definition. Double vision occurs when you’re looking at one object but it appears as two separate but identical objects. Double vision occurs as a result of impaired binocular vision, and can affect a child or an adult. Diplopia is the medical term for double vision. What Causes Double Vision, or Diplopia? Double vision, or diplopia, occurs when your eyes don’t work as a team. Each eye sees an image from a slightly different angle. When your visual system is working correctly, the eyes should align to look at the same point on an object. Once aligned, the brain combines to produce a single, 3D image. If your eyes are not pointed at the same spot, your brain can’t combine the two images and you will then see in double vision. You may feel nauseous, dizzy and may have trouble keeping your balance. Strabismus occurs when one of the eyes is turned inward, outward, up or down. Not all types of strabismus will cause double vision, but some do. People with brain injuries such as concussions often see double to some degree, as head traumas can cause problems with eye teaming. A stroke, brain tumor, brain swelling or a brain aneurysm can contribute to double vision. Presbyopia is a Greek word that means “old eyes.” It occurs when a person’s internal lens loses the flexibility to focus on objects within arm’s length and reading glasses are needed. In some cases, long-standing eye teaming problems that have been compensated for start to emerge as the visual system reorganizes itself. Double vision may result. Milder cases of double vision can result from these conditions, both of which are problems with the eyes’ ability to team. When double vision does happen in these cases, it’s typically when the person is looking at a near object, such as a book. This is sometimes described as ‘the words moving around on the page’ because the text appears to move as the image oscillates between being single and double. Monocular diplopia is double vision that is seen when one eye is covered. The following are potential causes of monocular diplopia and they are typically not treatable with vision therapy: Complications of refractive surgery (e.g. 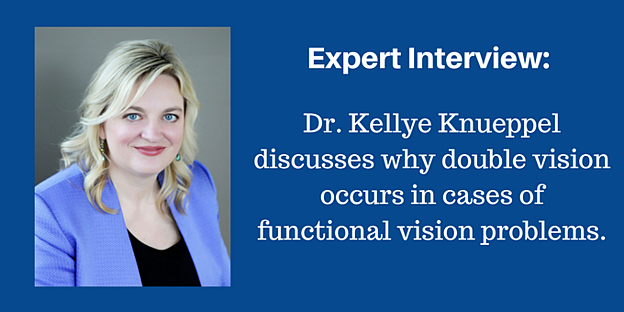 LASIK, PRK), cataracts, an eye injury and astigmatism. 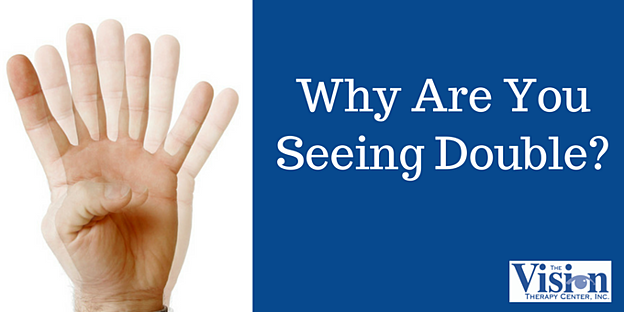 Are There Different Types of Double Vision, or Do You Experience it in Different Ways? Anyone who is experiencing a recent onset of double vision needs to be evaluated by an eye care professional or neurologist immediately. A sudden onset of double vision could be a sign of pathology in the brain. Once any pathology has been ruled out or treated, you can explore treatment options for any remaining double vision. You may experience double vision that is only temporary that can be caused by an eye teaming problem. This tends to be triggered by fatigue or when doing a large amount of reading or computer work. Vertical diplopia is when one of the images split up and down instead of side to side, as is the case in horizontal diplopia. Horizontal diplopia is when two images appear side by side, and is the most common. Rotational double vision occurs when one image is rotated compared to the other. You can have horizontal and vertical double vision at the same time. Double vision and fatigue usually go hand in hand. Generally, the more fatigued someone becomes, the worse the double vision will be. People can experience diplopia when looking at near distances, far distances or both. Having the wrong prescription may cause double vision. Double vision can affect people in a number of ways. You may feel lightheaded or have headaches, especially when looking up or looking down. In order to maintain balance, the visual input to the brain has to match up with what is perceived by the vestibular system. When vision is doubled, the brain has difficulty integrating the visual and vestibular systems, which can lead to nausea, dizziness and vertigo. Double vision can range in its severity. Mild causes of double vision may only produce a slight shadowing effect. At the other end of the spectrum, severe double vision will result in two distinct images that can be pretty far apart. Surprisingly, people who have double vision can learn to live with it. It’s not entirely comfortable, but there are many stories of people who find ways to adapt and function in society, despite their double vision. 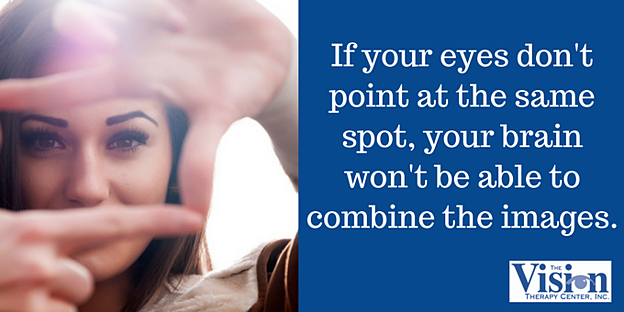 In many cases, the visual system will suppress one of the two images being sent to the brain. While this solves the problem of double vision, it creates a new problem - the person loses binocular (two-eye) 3D depth perception because they are no longer looking with both eyes. What Can be Done to Correct Double Vision? An effective treatment for double vision is optometric vision therapy. Through a series of activities, vision therapy can help you gradually train your eye teaming skills and improve your binocular vision. 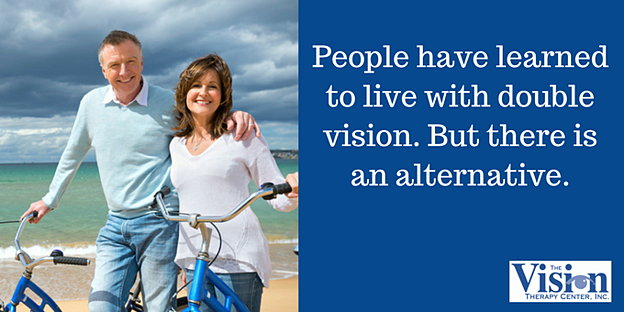 Vision therapy is a treatment designed to work on the underlying problem and, in best cases, eliminate it. Other forms of treatment designed to compensate for the problem include prism glasses and occlusion (covering an eye or part of the vision for an eye). At The Vision Therapy Center, the doctors have special training in prescribing the most effective glasses, such as prism glasses, and/or occlusion for best functioning. These treatments can be used alone or in conjunction with vision therapy for the best outcome. 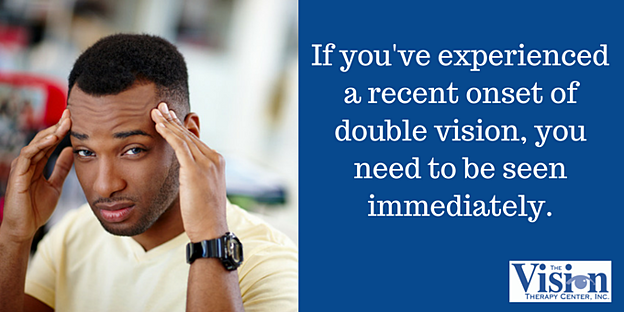 Keep in mind that the amount of double vision that can be reduced will depend on your visual condition. A Functional Vision Test is the first step in determining the extent of your double vision, and what types of treatment can be used to correct it.